I felt a serene solitude viewing photographer Aida Muluneh’s pieces this past weekend, as I unexpectedly stumbled upon her vibrant portraits in the “Being: New Photography 2018” exhibit of the Museum of Modern Art. Now, Muluneh serves as my admitted creative muse. She elevates the craft, creating her own path – unaffected by modern thought. Muluneh’s work offers more than visual appeal. It makes onlookers present. Her work offers insights – lofty in their hopefulness, but seemingly tangible in their depiction. In those moments of observation, it’s easy to forget the world as we know it and get lost in her pieces’ surreal depictions of raw, unscathed human stories through the lens of surrealism. According to Muluneh’s official website, which houses a great deal of her photojournalistic, commercial and contemporary work, the most impressive pieces were drawn from her 2016 “The World is 9” series. And, apparently, that indescribable feeling of hyper-mindfulness is merely the logical fruit of her life’s mission. Muluneh explains that the series, inspired by her nine-year residency in Addis Ababa, Ethiopia, aims to “[ask] provocative questions about the life that we live – as people, nations, as beings,” all within the context of the unachievable standards we hold ourselves to. Standing affront “All in One” (pictured right), which boasts beauty in subtlety, pondering just that is inescapable; to the forefront comes the gravity of human life which, contrary to the preachings of modern commercialism, is best appreciated by its very virtue – not in the pursuit of status. 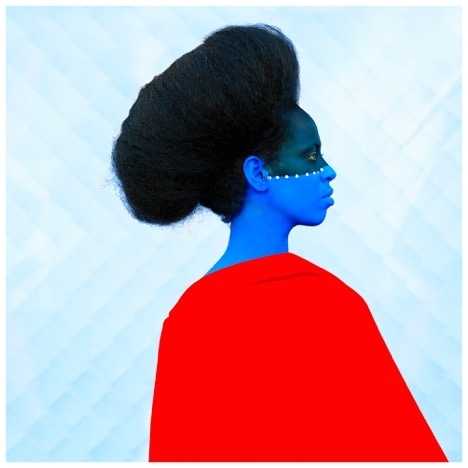 Played out, Muluneh’s creative vision showcases black beauty, juxtaposing pristine, muted tones to gorgeous primary colors. These tones are solicited from a wide set of materials: face and body paint, silk fabrics, architecture and man-made props. Elements are layered, the subject remaining a focus, but embedded in the context of Muluneh’s self-curated environments. In locking eyes with the gazes of these stunning women, wrapped in angelic cuts of fabric and brought to life with explosions of color, light and shadows, viewers are catapulted into mindfulness. Onlookers stare, and continue to do so. You ponder the subjects’ very real lives and can’t break the enchantment of Muluneh’s supremely unorthodox approach to human representation. The MoMA outwardly asserts that the exhibit is intended to force visitors to contemplate the way we view self in the context of environment. And, while “Being” does brings together an international group of 17 artists at different stages of their careers and offering a unique perspective, it’s easy to be blindsided by Muluneh’s provocative portraits alone. Her work drags viewers to hierarchies of “what ifs,” even for the most realist critics. And that’s the beauty of contemporary art; it makes lovers of the craft, sceptics and artists themselves present in a place of peacefully idealistic thought. Really, in the MoMA’s “Being” gallery, it feels callous not to stand arm’s length away, risking a sensor-triggered alarm booming throughout the touristic hotspot. Her work is that powerful. Muluneh clearly garners her fire for the craft in mindfulness of the world around her – then bled out into others in her prints. People interested in the craft must too be mindful – and Muluneh’s work is one of many steps to accomplishing just that. Those interested in Muluneh’s work can view her projects online at aidamuluneh.com or visit “Beings” in-person at Manhattan’s Museum of Modern Art from 10:30 a.m. to 5:30 p.m. daily.